Each sculpture represents a home, and a story. As an architect, Mohamad Hafez specializes in bringing abstract ideas to life in the form of structures. He helped design a 60-floor skyscraper in downtown Houston and a bank in Lebanon, to name just a couple of his projects. 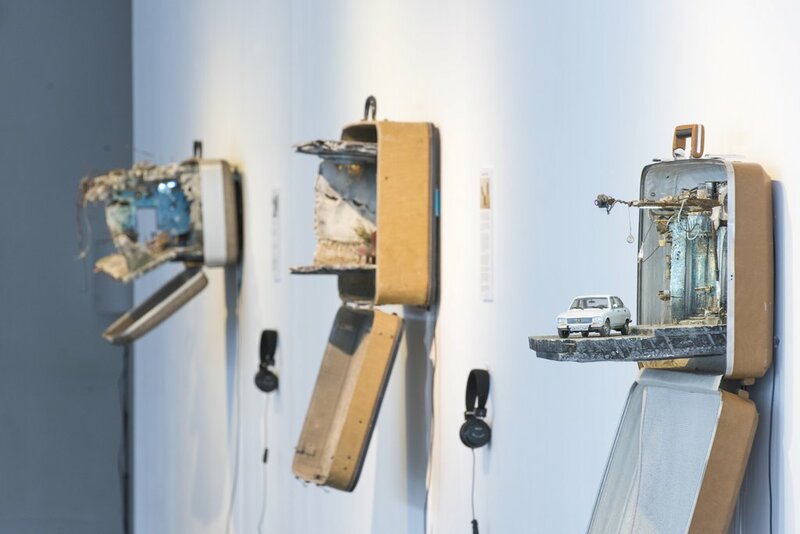 But on the side of his profession, the 33-year-old Syrian, who grew up in Saudi Arabia and attended college at Iowa State University, is bringing something else to life as an artist: refugee narratives. 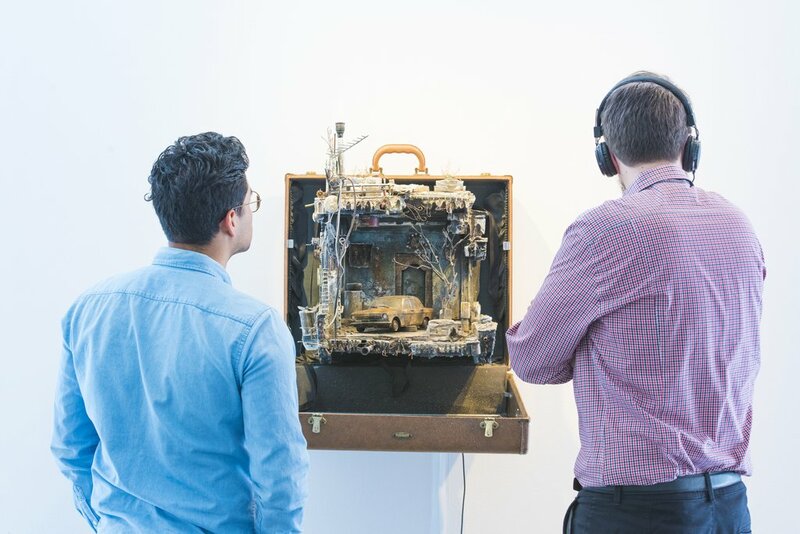 Hafez — whose family has been split up by wars, migration, and visa requirements; who lives in a country that’s now openly hostile to the idea of accepting refugees; and who has always been obsessed with construction and reconstruction — is telling refugee stories through a new medium: suitcases. At a time when the US government is threatening to lower the cap for refugee admissions from 110,000 to 45,000, and around the world more than 60 million people are forcibly displaced by conflict, hunger, and climate change, Hafez’s work brings these staggering statistics into view in a deeply personal way. 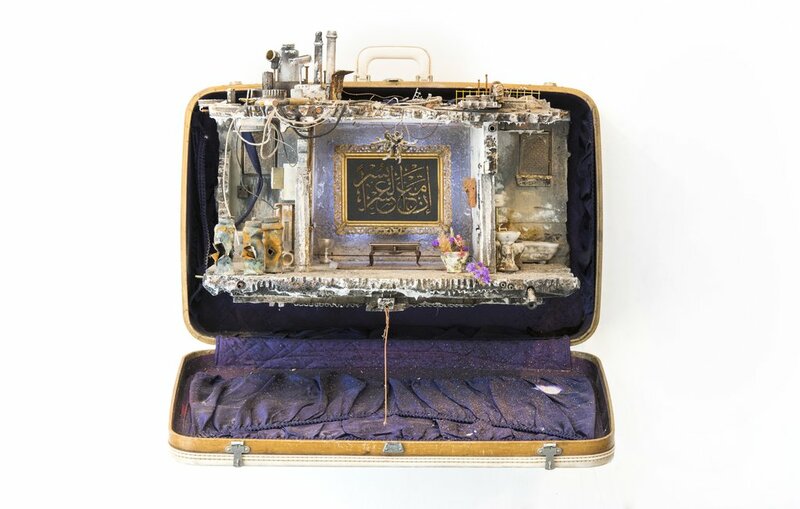 His work, which was displayed at Yale University’s Whitney Humanities Center, and will also be shown at New Haven's City Wide Open Studios on October 14th and 15th, embeds refugee stories into literal suitcases, presenting them as miniature recreations of the homes refugees leave behind. 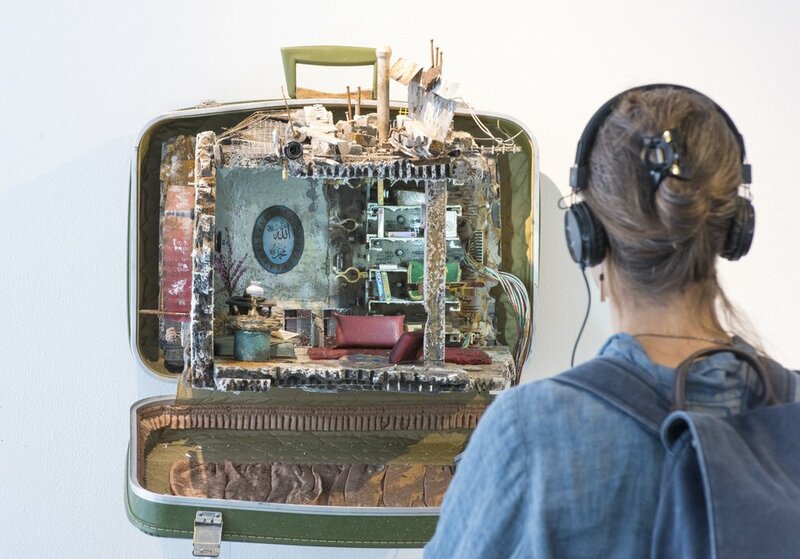 The display is accompanied by an audio component, where viewers can listen to refugee families tell the story of their displacement. “Their problems are not refugee problems, they are human problems,” he added. 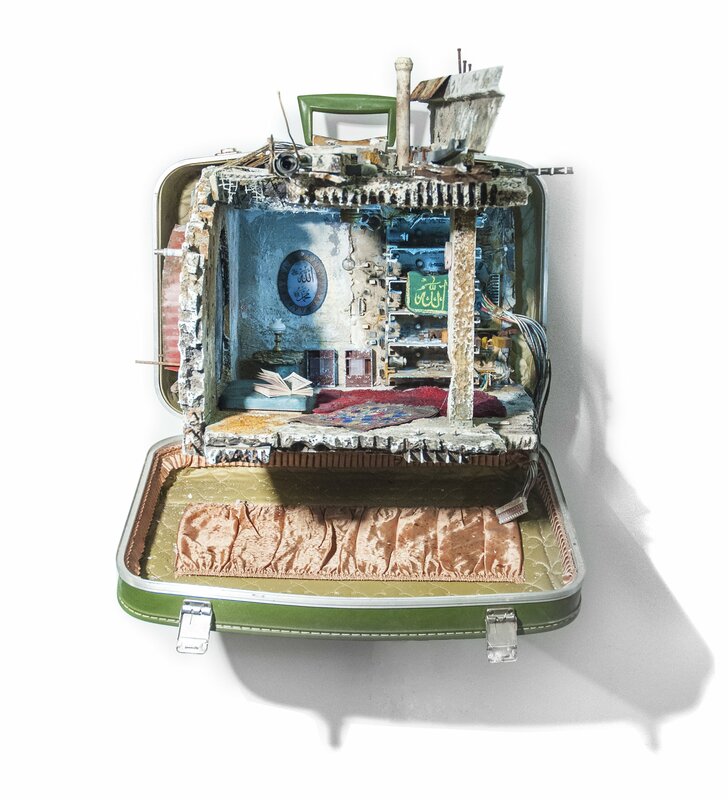 As an artist, Hafez has always been obsessed with detail, and his suitcase project, entitled “UNPACKED: Refugee Baggage,” demonstrates this. 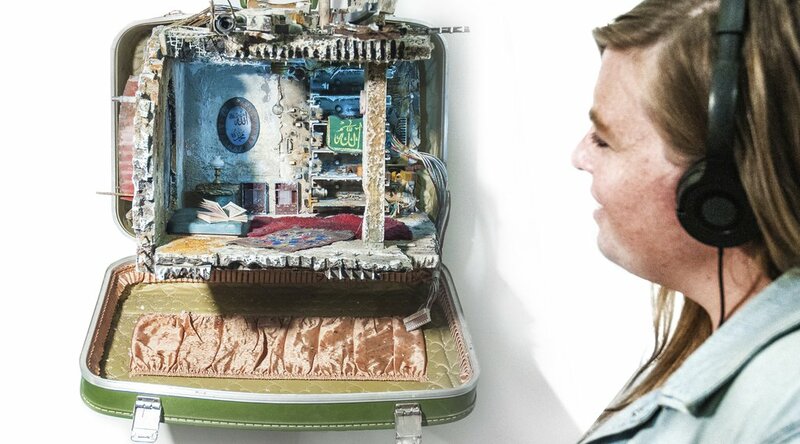 Each individual suitcase takes several months to complete, he said. 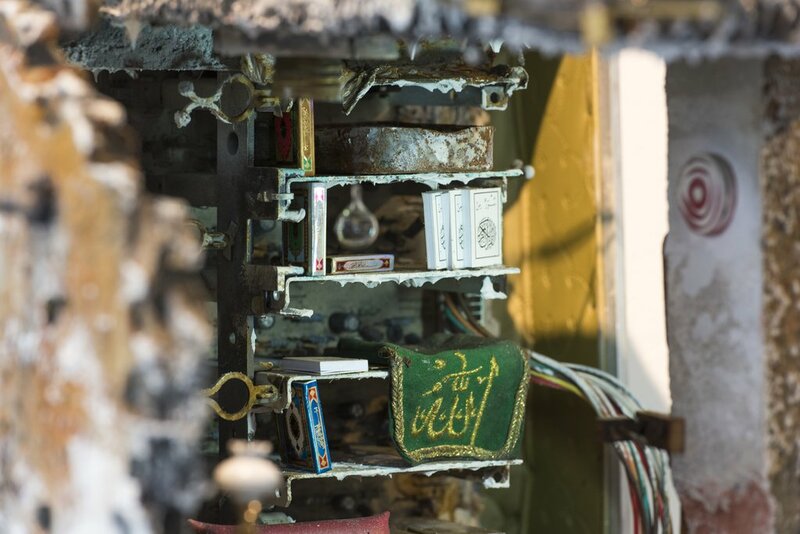 In one suitcase, viewers are confronted with the bombed wreckage of a family home, a green prayer rug with Arabic text on it one of the only objects remaining unsullied on the inside. In another, two tea saucers sit half full on a coffee table. An unmarked white car sits ominously outside an abandoned residence in a third. 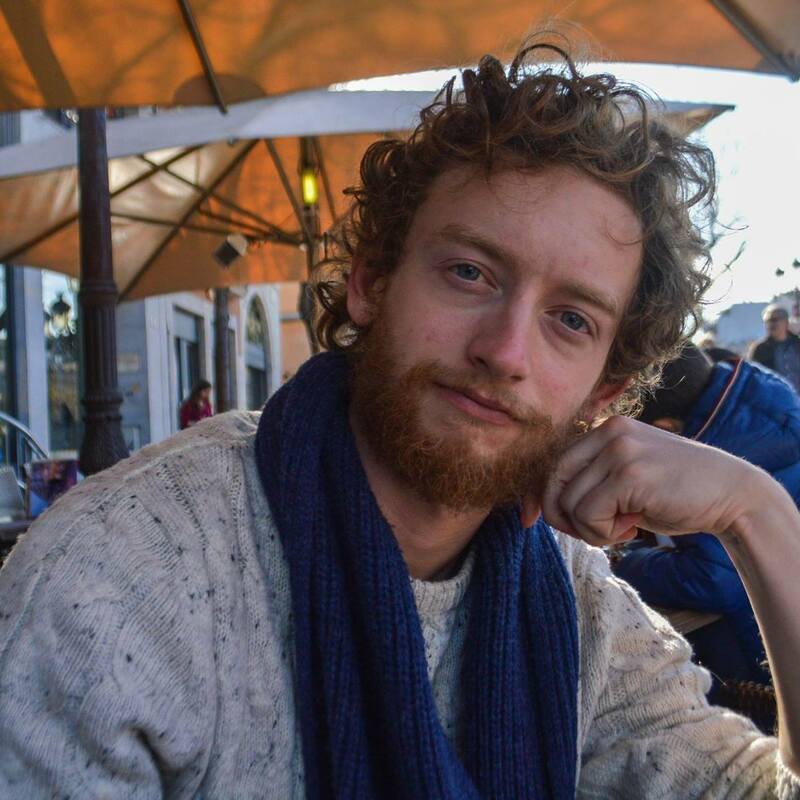 For the audio component, Hafez sat with 10 refugee families (some of whom had been resettled after the 2016 US election) and Wesleyan University student Ahmed Badr, who created an online platform for telling refugee stories called Narratio, for hours on end, listening to their stories. As they spoke, Hafez took architectural notes that would inform his later sculptures. Hafez, who is based in New Haven, began creating these detailed dioramas in college, spending hours at the Iowa State University art studio. The subjects of “UNPACKED,” he said, are friends, family, as well as some new refugee families resettled across the country in the past months and years. Since the 2016 election, hate crimes against migrants and refugees — especially Muslims — have increased significantly. Hafez’s wife, who wears a hijab, has been a regular target of xenophobic language, he said. Through telling refugee stories, Hafez is helping make refugee voices louder, even as they are silenced. Instead of hiding from people that define refugees as dangerous, as ‘the other,’ he hopes to change their minds through his artwork. Going forward, Hafez plans to take this message on the road. He hopes to document refugee stories in each one of the 50 US states, focusing on individuals and families resettled after the 2016 election. The end product of this? A collection of 50 suitcases that, taken together, “draw an image of who we were told to fear,” he said. Hafez, quietly, is showing that he’s at the forefront of that important struggle.